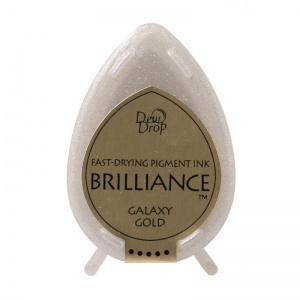 This Brilliance dew drop ink pad (sized approx. 1.5 x 1 Inches) in Galaxy Gold colour is designed for use on shiny papers, vellum, mica, acetate, photo papers, sculpey clay, shrink plastic, and much more! Ideal for scrapbook embellishments - no smeared pages or smudged page protectors.